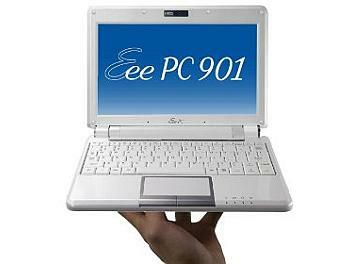 The Asus Eee PC 901 provides the power of a full-sized laptop in a compact body with a larger 8.9-inch screen, and is now powered by the latest Intel mobile processor. Designed specifically for mobile devices, the 1.6 GHz Intel Atom processor uses a brand new design structure new hafnium-infused circuitry--which reduces electrical current leakage in transistors--to conserve energy, giving you more time away from the wall outlet. Coupled with the ASUS exclusive Super Hybrid Engine, you'll also enjoy up to 8 hours of battery life with this Windows-powered laptop.